1x Magic Wand. Notebe careful when you open or close the magic wand. Material : Stainless Steel. Color: Silver. All pictures are for illustration purpose only and Colours may vary slightly. EUR 1.23 1113 sold. Stainless Steel Build. The PocketStaff is built from a high-grade stainless steel which can be used for martial arts and self-defense. Easily put back the Pocket Staff into its small form by twisting and pushing it down, locking it with the top pin. Carry around the PocketStaff to ensure your safety and self-defense! It extends from 2"(5cm) to 5' or 120 cm in a matter of seconds. Stainless Steel Build. The PocketStaff is built from a high-grade stainless steel which can be used for martial arts and self-defense effectively. Ebony Nunchuck. One piece of Ebony Nunchuck. Material: Ebony Wood. This numchuck can be twisted to make a weapon stick. Type: Nunchaku. Thick foam pad covers the plastic stick. Harmless training tool and NOT a weapon. Each Stick Length: 28 cm/11.0 ". Material: Foam Plastic. Chain Length: 16 cm/6.2". Precision plastic swivel bearings allow for smooth and consistent operation. 1x Magic Wand. Note ：be careful when you open or close the magic wand. Material : Stainless Steel. Color: Silver. total open length：110cm. Trending at C $5.97eBay determines this price through a machine-learned model of the product's sale prices within the last 90 days. 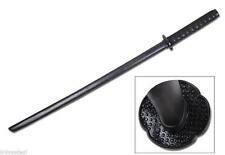 Product Description: The Zatoichi Hanbo is a functional representation of many styles of fighting. It is harvested from the hardwood of a tree trunk, giving it strong characteristics. Product Description: Our Martial Arts training three sectional staff is foam padded with a PVC core. Foam padding is safe to use for training and students. Each ball bearing linkage fitting is stainless steel with a stainless steel chain. 1x Magic Wand. Notebe careful when you open or close the magic wand. Material : Stainless Steel. Color: Silver. total open length110cm. Trending at C $14.08eBay determines this price through a machine-learned model of the product's sale prices within the last 90 days. 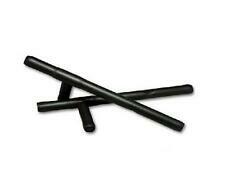 Lightweight durable rattan escrima sticks. Sold in a pair. Best way to display your kama or sai. Easy assembly. This staff had a size of 72". It is preferred by many martial artists because of this quality. They are also excellent for kata and strength training in the martial arts. Hickory prevents this bow from having almost any wobble or flex, and has a great sturdy feel. AUTHENTIC NIGHTHAWK COMBAT CANE TOMAHAWK HOOK FOR STRIKING. One in the mouth and the other Up-Side his head. When he could see the next blow would be from the Hooked end he backed off. I lost my Cane and all Canes after yours is Junk. The Bo Staff is a traditional Okinawan training tool used in Kobudo style martial arts. 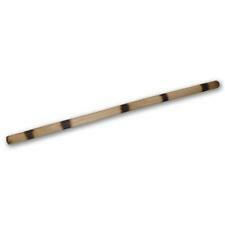 This particular staff is made from laminated white oak and has a length of 71". Which gives it maneuverability for the bo to be used with a great feel for kata and techniques. (This is shown in the last two pictures) It is quite striking and unique. And of course the dark ipe down the middle. Ipe wood is twice as hard as ipe on the wood hardness scale. The laminations of the various woods increases the strength of the wood by having the grain structures reinforce one another. Lightweight rattan. Natural rattan finish. Key Features. 3.5 out of 5 stars - Martial Arts Rattan Wood Bo Staff Karate Jo Weapon 72"
4 product ratings4 product ratings - Martial Arts Rattan Wood Bo Staff Karate Jo Weapon 72"
The materials consist of beautiful exotic Purpleheart on either side and a strip of heavy white hickory down the center for added straitness and effect. Purpleheart is a well known exotic hardwood coveted by many martial artists. The materials consist of laminated hickory. Light sapwood, and light brown to darker brown heartwood. The differences in color is purely aesthetic in nature and does not affect the integrity of the staff. One in the mouth and the other Up-Side his head. When he could see the next blow would be from the Hooked end he backed off. I lost my Cane and all Canes after yours is Junk. I plan to buy another one as soon as I get moved. Epic Kendo Shinai I - 47". This amazing combat ready, fully functional, high quality Shinai Kendo stick is simply amazing. We were tired of the poorly designed. the "Epic Kendo Shinai I" manufactured exclusively for WeaponMasters. The Ni Tanbo are also known as Kali Sticks or Escrima Sticks. This is an upgrade from common Rattan sticks. The materials consist of solid Ipe wood which is an exotic wood twice as hard as hickory. They link together to form the ultimate fighting stick. This is perfect for Arnis martial arts practitioners and students. 1 x Arnis Escrima aviation aluminum fighting stick only (w/ camping knife tools). These lightweight, foam nunchucks are perfect for beginners. The beautiful dragon insignia gives them a genuine martial arts feel. Martial Arts. Self Defense & Security. Foam Construction - Perfect for Beginners or for Practice. Trending at C $21.51eBay determines this price through a machine-learned model of the product's sale prices within the last 90 days. 60 " Wooden Bo Straight Staff Martial Arts Karate. -The staff has been constructed from wood with engraved dragons. Overall Length: 60 " Material: Wood. It is your responsibility to check the item for any possible defects before using this item. FREE BASIC TRAINING COMBAT CANE DVD. 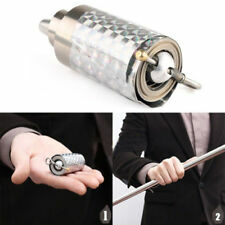 ANYONE CAN LEARN TO DEFEND YOURSELF USING THE CANE. FOR MORE THAN 26 YEARS HE HAS TRAIN THOUSANDS OF PEOPLE TO DEFEND THEMSELF USING THE CANE. PERFECT FOR SELF DEFENSE. MaterialStainless Steel. MPNDoes Not Apply. 1 Pair of Tekko. Tekko were a traditional fishing tool used to protect the fingers while bringing in the fishing nets. There are several traditional tekko kata which can be viewed online but. you can also perform any of your own kata with tekko in your hands to. This is a Standard White Oak Jo used widely by Aikido, Jodo and Koryu practitioners. This is the most popular 9-bu (27.3mm) model. Because of the durability and weight of Shirogashi, it's widely regarded as great material for making high quality Bokken and Jo. Warrior Okinowa Competition Bo Staff martial arts weapon training tkd Karate 72"
Competition Toothpick Bo Staff Martial Arts Weapon with Dragon Light Karate 66"
Burned Rattan Bo Staff Martial Arts Karate Practice Escrima Kali 60"
Martial arts refers to a system of training for combat in the pursuit of self-defense and self-enrichment. With numerous types of martial arts from around the world, practitioners have many styles to choose from when learning to fight. Among these many styles, several of them incorporate weapons into their training regime. What kinds of martial arts use weapons? Itto-Ryu: Itto-Ryu is a form of Japanese sword fighting. It is cited as one of the main inspirations for the sport of kendo. Nunchaku Do: A form of martial arts based around the Okinawan nunchaku (or nunchucks). Eskrima: Also known as kali or arnis, it is a Filipino martial art that utilizes sticks as blunt striking tools. Tahtib: An Egyptian martial art using long poles or rods for combat. Mau Rakau: A traditional fighting style of New Zealand's native Maori people, it involves different systems of combat for fighting with short spears or poles, knives, and axes. A "kata" is a Japanese word for a series of stances that martial artists rehearse during training that helps them to improve their discipline. While most associate it with hand-to-hand combat, weapon-based fighting also uses katas for practicing. What kind of weapons are used by martial artists? Sword: Swords are long bladed weapons held with either one or two hands. Swords can vary in length depending on style but are usually between 1 and 3 feet long. Some styles of sword include the katana, the zweihander, and the saber. Staff: Staffs are long sticks around the height of the user (anywhere from 3 to 6 feet long) that can be used for striking and blocking. Different staffs have different names depending on their length and the martial art they're used in, such as the bo staff being used for bojutsu. Sai: A sai is a short, three-pronged piercing baton used in several types of Okinawan martial arts, typically used in pairs. 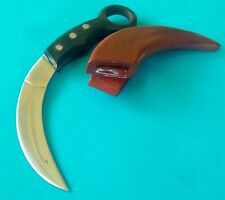 Kama: Kamas, otherwise known as hand sickles, are short sickle-like weapons used for slashing. They can be used single or in pairs. Kamas are also the basis for the tool known as the kusarigama, a hand sickle with a chain and weight attached to the other end. Baston: Baston are short sticks around two feet in length used in different kinds of Filipino martial arts like eskrima. Meant to be used in pairs, they can be used for striking or defense.